and it filled the entire house... (Acts 2, Pentecost ABC). How would you characterize the wind of Pentecost? Is it a gentle wind that freshens and cools? Is it tornado-like in its force? Does it blow down what is in its way? Does it provide sailing currents for birds and butterflies as they fly along? How would you describe the wind of Pentecost? Of course there isn't just one wind, there are many. Each is associated with a particular direction. 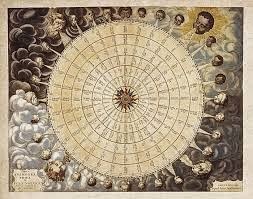 One place to see all the winds together is on a wind rose, a graphic tool used by cartographers and meteorologists. The wind rose organizes the winds according to their direction of origin. Wind roses may show as few as four or as many as 32 winds. In the classical world each of the four major winds was named, personified and given particular attributes that made them recognizable. Eurus, the east wind, is shown as a young boy with his cheeks puffed out, blowing a gentle breeze. Zephyrus, the west wind, is also a young person whose face looks merry. Perhaps that is because he is bringing gentle spring breezes. 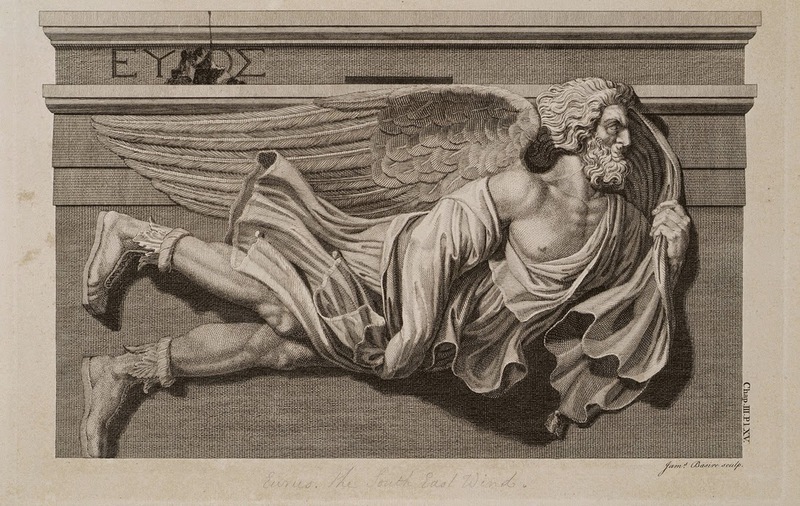 Boreas, the north wind, is shown as an old man and brings the cold north wind. He is often wrapped in a cloak and may have an unpleasant look on his face with his beard crusted with snow and ice. Notus, in Latin called Auster, is the wet south wind of late summer storms. He may look disagreeable as well. Often in his hands is a vessel from which a stream of water flows. The water may be populated by frogs, grasshoppers and other creatures associated with moisture. The chart below shows all the winds, giving several translations of each wind's name and giving each wind it own personality. Tabula Anemogra Phica Seu Pyxis Navtica by Jansson. Amsterdam 1650. 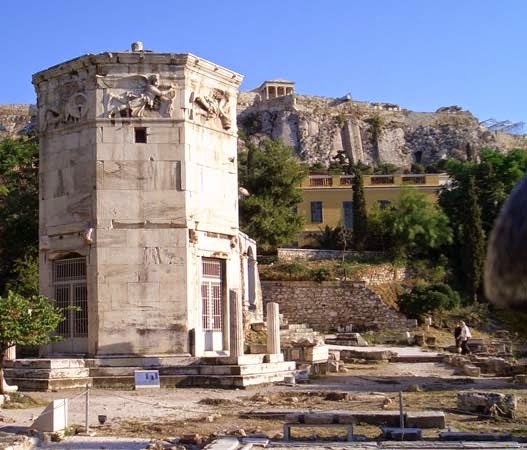 In Athens, the Tower of the Winds (built 100 - 50 BCE) gives form to eight winds, one on each side of the octagonal structure. Built as a timepiece (sundials are on the sun-facing sides of the buildings, and a water clock was inside as a back-up on cloudy days), the structure was extant when Paul was in Athens (Acts 17). The winds are at the top of each wall. The eight winds are: North...Boreas...Man wearing a heavy cloak, blowing through a twisted shell; Northeast...Kaikias...Man carrying & emptying a shield of small round objects; East... Apeliotes ...Young man holding a cloak full of fruit and grain; Southeast...Euros...Old man wrapped tightly in a cloak against the elements; South...Notos...Man emptying an urn and producing a shower of water; Southwest...Lips...Boy pushing the stern of a ship, promising a good sailing wind; West...Zephyros ...Youth carrying flowers into the air; Northwest...Skiron...Bearded man with a bronze pot full of hot ashes and charcoal. Is one of these how you picture the wind on the day of Pentecost? Young, old, happy, grumpy, pleasant, scouring. How would you characterize the sudden rush of wind? 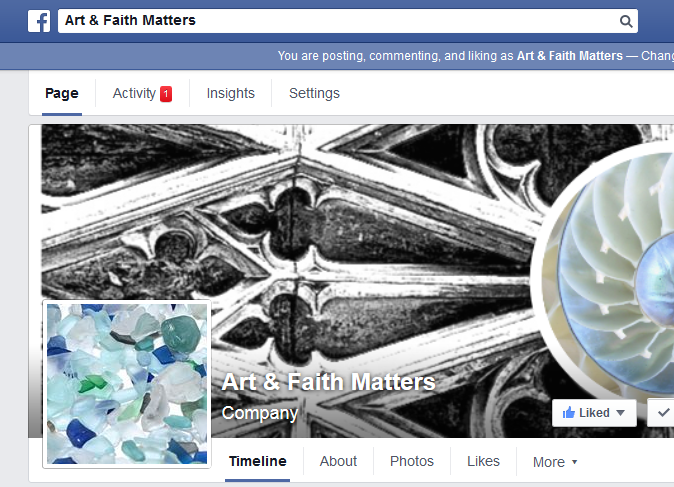 On the Art&Faith Matters Facebook page, more on Eurus, the east wind, from the Tower of the Winds. Click on the link.